Loaded with nourishing protein and omega-3 fatty acids, ACANA Wild Coast features sustainable fish, wild-caught off North Vancouver Island’s cold Pacific waters and delivered FRESH and WHOLE, so they’re bursting with goodness and taste. Free of high-glycaemic carbohydrates, ACANA features low-glycaemic and locally grown steel-cut oats that help promote stable blood sugar and peak physical conditioning. Prepared in Champion Pet Foods’ award-winning kitchens with fresh, trusted and regional ingredients, we think you’ll love ACANA. More importantly, we think your dog will too! 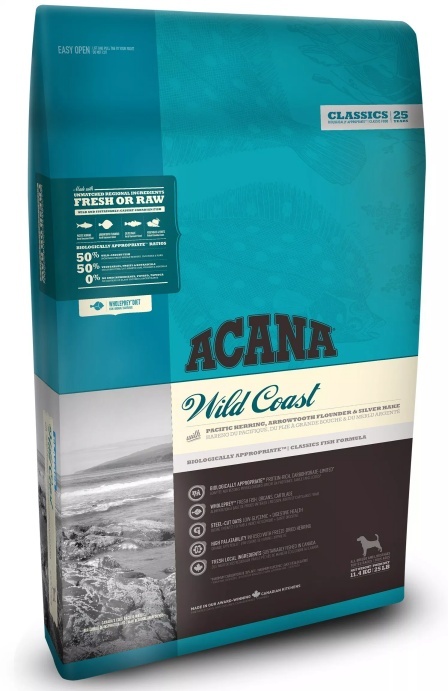 ACANA Wild Coast is loaded with 50% wild and sustainably caught fish, including Pacific herring, Arrowtooth flounder and Pacific hake, all deemed fit for human consumption. 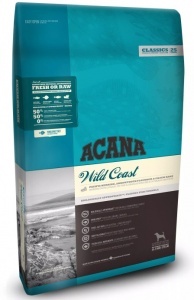 Using fresh fish in their most natural and nourishing form, one third of the fish in ACANA Wild Coast is authentically fresh and loaded with goodness and taste. Two thirds are dried or oils to provide a concentrated, natural source of protein, supplying essential nutrients and providing the natural flavours and goodness dogs instinctively crave. The ingredients are from fish deemed fit for human consumption — a rarity among today’s pet food makers. Crude protein (min.) 29%; Fat content (min.) 17%; Omega-6 fatty acids (min.) 2.4%; Omega-3 fatty acids (min.) 1.4%; Glucosamine (min.) 700 mg/kg; Chondroitin sulfate (min.) 900 mg/kg.